This article is the second in a four-part series that addresses the 2018 tax reform and some of the impact it will have on companies that purchase heavy equipment and need equipment financing. This was an interview conducted by Mark Lempko and Don Pokorny, both of CCG, with Dixon Hughes Goodman LLP (DHG). The information conveyed herein is meant to be informative and should not construed as specific tax advice. CCG: Can we discuss the proposed effective tax rates relative to C Corp structures and the impact legislation will have over the previous tax system? I know that’s a loaded question, sorry. DHG: The new C Corp rate was reduced from a high at 35% down to a permanent 21%, so it’s not scheduled to change. 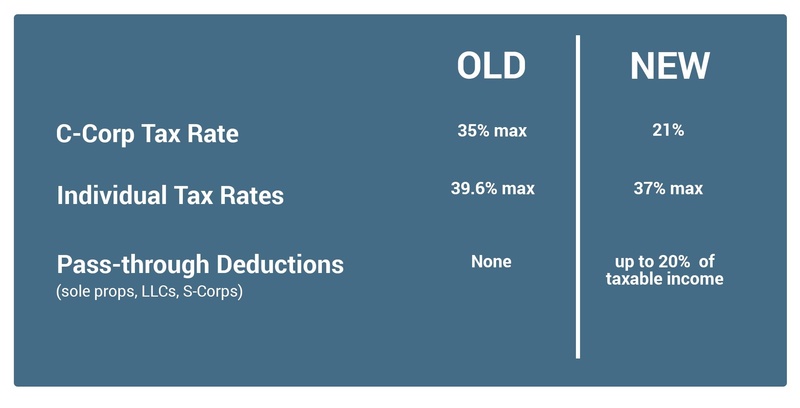 That’s the big change, a reduced tax rate from 35 to 21 for C Corps. CCG: So, there is no laddering? DHG: The previous regime had a graduated rate scale, but we have moved to a flat rate scale. CCG: Regardless of whether you are making 100 thousand or 3 million or 15 million, it’s a flat 21% after tax income? CCG: That seems relatively straightforward. CCG: Do you have a sense of what this impact will be for many of these small business (what I will call small businesses) in the various structures – sole proprietors, LLCs, single member LLCs, S Corps? Are they all going to be lumped together in the pass-through definition? Also, can you give any discussion as to how people are going to figure this out? I saw a chart that I could not believe in terms of how that tax rate is going to be calculated. DHG: For the most part, sole proprietors, partnerships, LLCs, single members, S Corps, schedule Cs and schedule Es are all treated as pass-throughs. They will be subject to tax at the shareholder/partner level. In most of your customers’ cases, it’s the individual level. So, they will not see the benefit of that 21% rate, but it’s ultimately taxed at the individuals’ rate or the partner/shareholders rates. CCG: It is my understanding that the pass-through rate was 29%, but you are stating that it really falls to the individual tax rate. Did I misunderstand that or is there other income that might be subject to that 29%? DHG: What you are referring to is, so the individual tax rates where the old highest tax rate was 39.6% and that was dropped to 37%. The way people are getting to the 29% effective tax rate is pass-throughs, including that whole list we talked about, are now eligible for a pass-through deduction. And there are many layers to that calculation, but let’s say you’re eligible for that maximum pass-through deduction, it’s 20% of pass-through taxable income, and by claiming the full amount of that 20% deduction, it has a result of getting your effective tax rate (if you’re at the top tax rate of 37% before that deduction) it drops your effective tax rate to 29%. CCG: Given this, do you believe that this modification and these rates between C’s and S’s would give companies some reasons to consider a change to a C Corp structure or is it simply too early to have that discussion with people? DHG: It’s not too early; there are lots of people having that discussion. We have been through it a lot with clients already and have done some analysis of it. To be honest, you have to have a very specific fact pattern for that to make sense to shift to a C Corp. And the primary reason is that C Corps are subject to double taxation. You’re only paying tax on the corporate level for 21% but then those dividends are distributed and taxed to the shareholder as taxable income again. So, when you combine that together, the dividend tax (the tax on the income as dividends) plus the income tax, it ends up pretty close to a wash. They are very similar in terms of the rate, but it is generally advantageous to be an S Corp or Partnership. It really only makes sense, in most cases, to remain a C Corp if you can leave the cash in that business and grow it at a greater rate of return than you can outside and achieve that huge deferral of not having to pay that tax on that dividend. If you can leave the cash part in that C Corp for years and years, then it may make sense. But you have to think about your exit strategy in that business. If you plan on getting out in 5-10 years, then you have to think about how you will get all of that cash out of that business, and it will end up being a big tax event. And, in a lot of cases, if you don’t hold that for a long period of time, say 10 years or more seems to be the cutoff range, it’s less advantageous to be a C Corp.
CCG: Any other commentary on these structures before we move on to the next. Nathan (DHG): Do not get carried away with that pass-through deduction. It has a lot of haircuts to it, a number of limitations, so people should not automatically assume that they are going to get the full 20% deduction. David (DHG): There are certain industries, and this is probably not the industries you are working with primarily, but some industries like professional service industries that aren’t even going to be eligible to look at things like that and take that deduction. Generally manufacturing and distribution is what it was intended for, but there are a lot of carve-outs. Nathan (DHG): I’ll give you a relevant example. Health organizations and health field businesses are not eligible for pass-through deductions. So, let’s say you sell an ambulance to a hospital, the hospital will not get that 20% deduction because they are in a health services business. I don’t know who normally owns the ambulance, but if it can be separated into just a business that’s really just transporting people around and not providing medical services, then it could be an option. But just be wary of that. The health field was one of the specifically-named industries that does not get the benefit of this pass-through deduction unless they are a very small business. Don Pokorny serves as the Senior VP of CCG’s Central and Western Regions with over 30 years of experience in the equipment finance industry. He also is an Illinois licensed CPA.